Recently, I have had a RIDICULOUS case of nostalgia. Maybe it’s because the last year has marked a few significant anniversaries (10 years since grad school, moving to Africa, Ellie’s 10th b-day etc), or because there have been a few too many farewell parties for good friends lately, or maybe it’s just because I’m getting older and I seem to have way more things to be nostalgic about?! Whatever the cause, this week it’s really bad, because ten years ago this past weekend, I brought a little bitty, 6 lb, 2 month old baby girl home to live with me, and BAM, just like that, I became a mama and we became a tiny family! When I moved to Swaziland in September 2004, where the orphan population was large and growing, my desire to adopt became greater and started to seem like more of a possibility. A few months later, on January 21, 2005, I ‘just happened’ to be visiting the children’s ward of the government hospital the same morning a tiny little baby was left there. 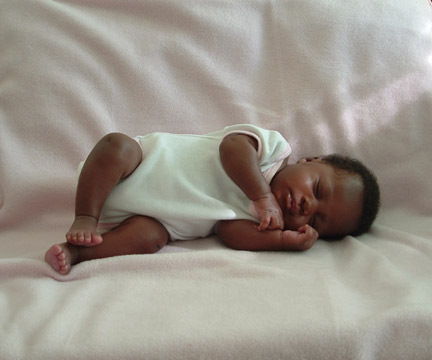 She was just days old, weighed less than four pounds and was quite sick. I was leading a semester long team of interns at the time, and we held her for a few hours that morning. I couldn’t get her out of my mind the rest of the day, and by the time my last meeting was over late that evening, I was dying to get back up to the hospital and see how she was doing. Thankfully a couple of my coworkers were ready to jump in the car with me and head up the mountain to the hospital to see that she was held and fed. The next day I called a missionary friend who runs a children’s home here, and who had also been a neo-natal nurse in the U.S., to find out what we could do. With a hospital so under-staffed and under-resourced, the baby’s chances of survival weren’t great. So we set up a feeding schedule, and myself and my team of interns, started doing baby duty. We were fairly clueless, but pretty determined! So very tiny! Just a couple days old. So, all of a sudden I found myself buying baby bottles, formula, and diapers. She was so tiny. I made her a little hat by cutting the toes off one of the complimentary airline socks I’d gotten on my flight to Africa just a few months before. At the hospital, I’d have Ellie in one hand, be trying to drip formula into her mouth with the other, and using my feet to stomp out the occasional cockroach. Several of us took turns spending the night to make sure she was fed, and for some CRAZY reason, I was even allowed to take her HOME for a weekend before she was officially released from the hospital. She slept in one of my dresser drawers. During the three weeks Ellie was in the hospital, my heart and mind were all over the place. From the beginning I sort-of-kind-of “knew” she was mine, but I also knew that in my sleep deprived and emotional state I might not be in the best place to make any huge life altering decision. Social welfare finally released Ellie into my missionary/nurse friend’s care. She hadn’t gained an ounce and was still quite weak, but she was finally in a place where she was able to get the around the clock attention that she needed. Ellie was at my friend’s house for several weeks, and they cared for her amazingly. I visited every chance I could. During this time I was finally able to take a day away to pray, lay it all out there before the Lord, and seek his direction. I took my Bible and notebook, and hid out at a local game reserve. I journaled all of my questions and concerns…”What about…?”, “What if…”, “Can I really…” I wrote them all out and left a big space below each one. I prayed, and read, and throughout the day the Lord brought scriptures to mind relating to each of my concerns. By the end of the day, I felt at peace with the decision to pursue adopting the little baby that had totally ran away with my heart. The intern team and I were leaving for a week-long trip to South Africa the next day, so my plan was that as soon as we returned, I’d start making phone calls and see where it led. We returned late the next Tuesday night. Wednesday morning I woke up saying, “Ok Lord, today is the day. Show me how to do this.” It was the middle of March. I figured maybe the best case scenario would be that by the end of May, after the intern team had left, I’d be able to get approved to start fostering Ellie. Even that sounded like it would require some pretty uncharacteristicly quick movement on the part of social welfare. BUT, about 9am that Wednesday morning I got a call saying that, for various reasons, it would work out best if I could start fostering Ellie on Sunday—FIVE DAYS AWAY. I remember pausing…and swallowing really hard…and blinking a few times, and in those momments thinking, I should say no. I need more time to prepare!! But wait! If this is my daughter, why would I want to spend another minute away from her? So I said, “Sure, that’d be great with me!” Aaaaaaahhhhhh! I was about to finish my thought with “Provider,” but before I could, God interrupted my inner rant: STOP. Provider is my name, not yours. It’s my job, not yours. Don’t try to be something that I haven’t called you to. That reminder from the Lord instantly brought peace and relief to this tired and stressed out mama. It has been something I’ve gone back to MANY times over the last ten years when I start to stress (which happens PLENTY). It has helped to keep me from trying to bear a weight I’m not meant to bear, and it has reminded me that I don’t have to be more…but that I need to rely on him more and be sure of who He is . It assures me that I am never alone in all of this. Isaiah 41:13 has been on my mind a lot lately: “I am the Lord your God, who takes hold of your right hand and says to you, ‘Do not fear. I will help you.’” Saturday was our “Gotcha day”, but what the Lord has reminded me of this week is that it’s not so much that I got Ellie or that she got me (although that is pretty awesome! **), it’s that He’s GOT US. He is faithful, and he is all we need. To celebrate our 10 year mile stone, I got you a little present! SUPRISE! 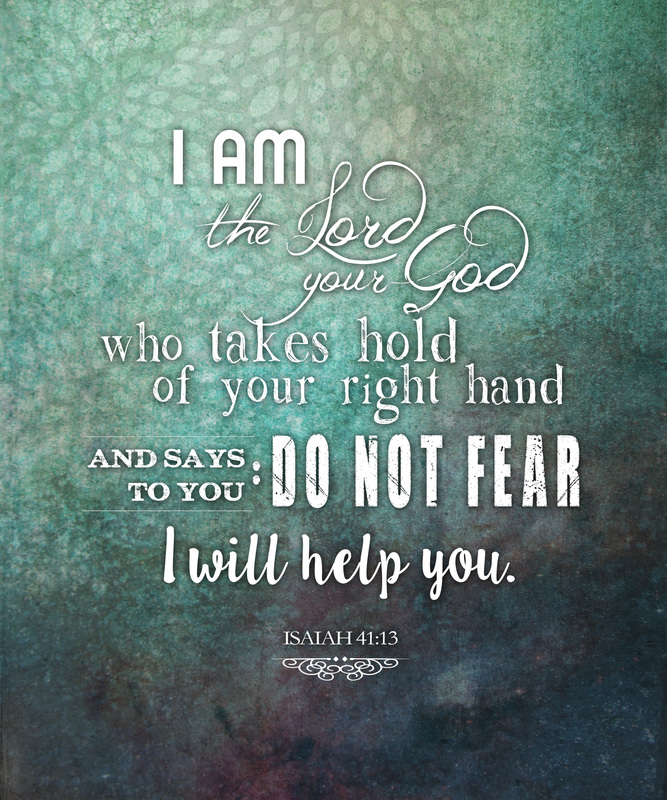 (really, don’t get too excited) I made a ‘printable’ of Isaiah 41:13. Print it out and put it somewhere where it will remind you that no matter where you find yourself today, God’s “got you” too. There is so much more to say, but I’ll stop here for now. If you have actually persevered to the end of this whole thing, thanks!!! You are AWESOME. Click on this image so it opens in another tab at full size. Then right click on the image and save it to your computer. That was such an awesome story to read – I always wondered, but never asked. What a wonderful testimony of trusting God in all circumstances. « Ten Years in Africa!